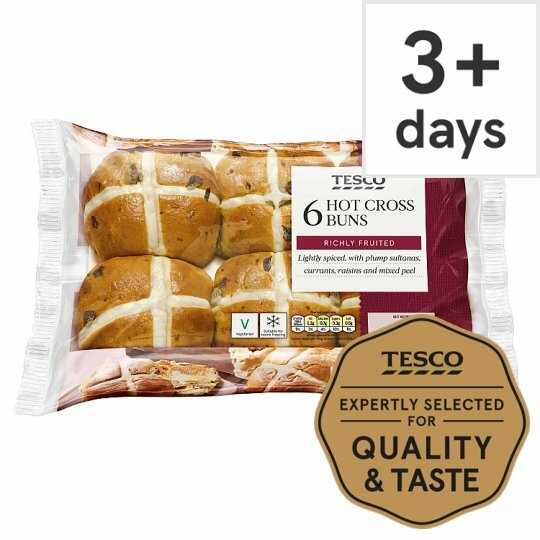 6 White hot cross buns. Richly Fruited Lightly spiced, with plump sultanas, currants, raisins and mixed peel Use for a delicious bread and butter pudding with a twist. INGREDIENTS: Wheat Flour (Wheat Flour, Calcium Carbonate, Iron, Niacin, Thiamin), Soaked Mixed Fruits (26%), Water, Yeast, Rapeseed Oil, Mixed Peel (2.5%), Sugar, Invert Sugar Syrup, Wheat Gluten, Maize Starch, Emulsifiers (Mono- and Di-Glycerides of Fatty Acids, Mono- and Di-Acetyl Tartaric Acid Esters of Mono- and Di-Glycerides of Fatty Acids), Palm Oil, Salt, Flavouring, Soya Flour, Flour Treatment Agent (Ascorbic Acid). Soaked Mixed Fruits contain: Sultanas, Raisins, Currants, Water. Mixed Peel contains: Orange Peel, Lemon Peel. May contain sesame seeds, milk, egg and peanuts and nuts. For allergens, including cereals containing gluten, see ingredients in bold. Instructions: Slice in half. Place under a pre-heated grill for 1-2 minutes until golden brown. Turn once. Medium. Defrost thoroughly for a minimum of 2 hours at room temperature.